Last night I found out that my friend, Paolo Zanotti died on December 5th, last year. He had been diagnosed with a tumor in the pancreas six weeks earlier. He was only 41. I met Paolo in 2002 at the Synapsis School for Comparative Literature in Pontignano near Siena. At first, I was struck by his resemblance to a character from the Commedia dell’Arte: his distinctive eyebrows, his expressive, expansive hand gestures. But the real magic of knowing Paolo lay elsewhere. I didn’t spend huge amounts of time with him, but over the years we met in Pisa, London, Oxford and, finally, in Paris. Every time, Paolo would leave me with an insight, something sharp that others might not have had the courage or wit to see. We had planned to meet in 2010, when I was in Italy. I sent Paolo an email saying that I was visiting. He wrote back that “since we HAVE TO meet, there are two options: either you may make a stop in bologna while on your way to pisa, or I can join you in your visit to Pisa!” We did not manage to meet that time. Paolo was a distinguished scholar; he had written several books on different literary topics. He had also written two novels and several short stories, which his publisher is planning to reissue in a single volume. Paolo had grown up in a small town called Novara in the middle of Italy; when I once asked him about it, he shrugged and told me it was tiny. He told me that his father made “rubinetti” – taps. I had never asked Paolo about his family before. It is his father and his mother, his girlfriend Georgia, and all the many people whose lives he touched, that I think about now. How very sad. I remember Paolo, walking along the narrow wall outside my college in Oxford on a sunny afternoon. 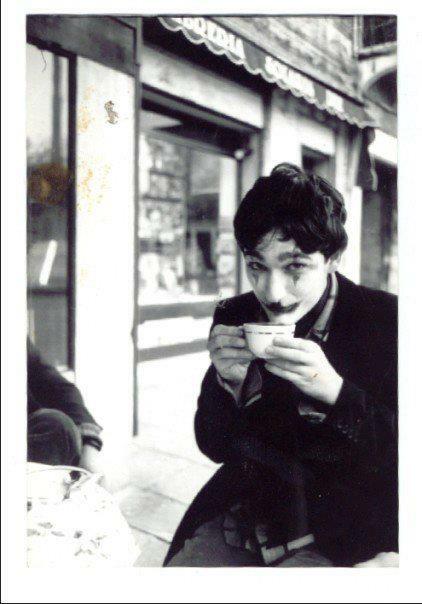 I remember tramping with him from the Marais to St Germain, all the while discussing our hang-ups and creative blocks. I remember him telling me never to wash a coffee maker and, when I resisted, (I had been trained to wash all dishes with plenty of fairy liquid) his insistance, “Ma viene meglio il caffe! Lo so. Sono Italiano.”* I’ve never washed a coffee machine since. I wish I had a chance to say goodbye; but maybe every friendship contains a form of leavetaking within its most carefree moments. *But the coffee turns out better. I know. I’m Italian. As a friend told me last night: “Paolo might have died, but he did not leave us.” Everyone who had the privilege to meet him will never forget how beautiful, clever, generous he was. Thank you for your beautiful words. Nash thank you for writing this – do you remember the madcap play we all put on at home with Paolo? Oh Nasho, Thank you for writing this. How could we ever forget Paolo. I’ve just remembered the time when, in Marks and Spencers (Whiteleys) with Florian Mussgnug and me, Paolo was shocked by the price of tomatoes: “Cinquemila lire per quattro pomodori!! !” Do you remember Flo? Or was it “Quattro pomodori per cinquemila lire!”?